Written by JONATHAN ­LANDRUM Jr.
Rapper 2 Chainz took some major risks two years ago when he bolted from Ludacris’ Disturbing tha Peace record label, changed his stage name and left a group to pursue a solo career. The Atlanta-based rapper, initially known as Tity Boi, scored big as a member of the rap duo Playaz Circle with the Lil Wayne-assisted 2007 hit “Duffle Bag Boy.” But the group's debut album barely sold 100,000 units, and their follow-up, 2009’s “Flight 360: The Takeoff,” debuted at No. 74 and didn’t launch any hits. Taking the risk to go solo is finally paying off. 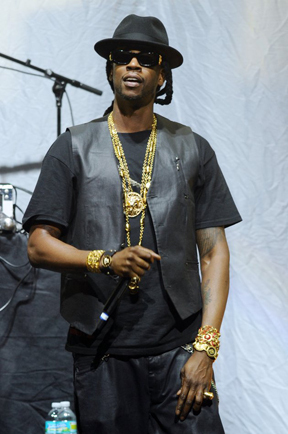 A pair of successful mixtapes helped 2 Chainz consistently book concert shows and land guest appearances on hit songs, including Kanye West’s No. 1 rap smash “Mercy” and the Nicki Minaj single “Beez in the Trap.” He also joined Minaj on her U.S. summer tour. Now the rapper is hoping to capture audiences on his own with his solo debut, “Based on a T.R.U. Story,” released this week. The first single, “No Lie,” features Drake and is currently No. 1 on Billboard’s R&B/Hip-Hop songs chart. The album features top acts like West, Minaj, Lil Wayne, John Legend, Scarface and The-Dream. The Associated Press: You had a sliver of limelight in 2007, you fell into obscurity and now you’re rising — a rare sequence for a rapper’s career. What do you attribute to your revived image? 2 Chainz: I just worked harder than anyone else. There was no formula. I can't tell you a particular story or a contract I signed. My mind-set of just grinding it out, a lot of sleepless nights, thinking and praying a lot. The number of cities I was able to play in. The timing. Those combinations have helped get me to where I’m at today. AP: You had a lot control as an independent rapper. Now, you’re signed to Def Jam Records. Why make the move when you were achieving so much independently? 2 Chainz: When I left DTP, I wanted to do things on my own. I wanted people to respect my mind. I wanted people to respect some of my ideas. The independent route was the best move for me. But I think I’ve maximized everything I could do independently. I’ve done everything out the mixtape market. I think getting the big machine behind you is the next stage when you’ve maximized the independent level. AP: How did you end up collaborating with A-List acts like Kanye West, Drake and Nicki Minaj? 2 Chainz: I had already been communicating with them. I’ve known Drake for five years. Me and Drake were on tour with Lil Wayne when Drake was fresh off the TV show (“Degrassi: The Next Generation”). A lot of people don’t know that. I’ve known Lil Wayne for a decade. I’ve had respect with them and in the hip-hop community. I just had to figure out a way to connect the dots with them and the fans. With the community, I was cool. I was networking, hooked up with DJs. I was just being a people’s person. AP: What’s it like working with Kanye West? 2 Chainz: He’s a great friend to me personally and has helped me musically. He’s helping me produce some of my best music. AP: You’ve become known for your various guest appearances. What do you want to prove with your first solo project? 2 Chainz: When we did “Duffle Bag Boy” I knew it was big because of Lil Wayne. I took it for what it was. He’s a superstar, a megastar. We worked hard and he worked his (expletive) off to be who he is, so he gets the credit for that. He opened a lot of doors for me. I just want to work as hard.